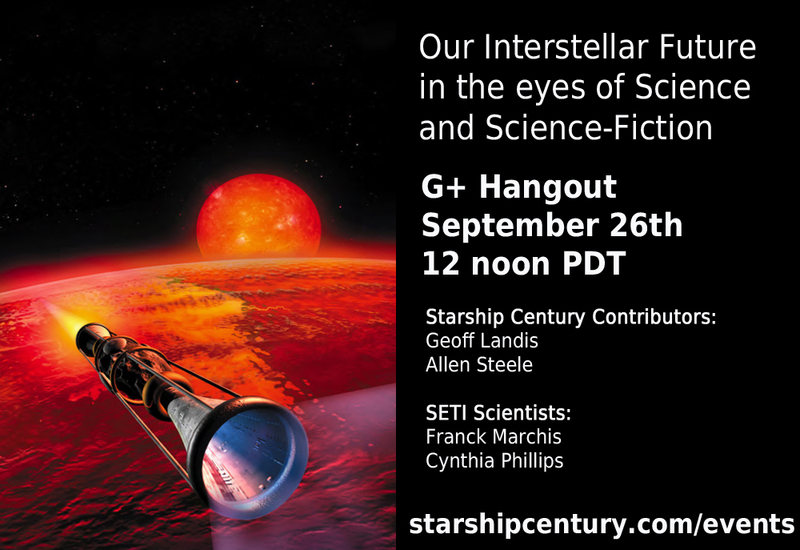 Geoff Landis, Physicist and Science Fiction Author and Allen Steele, Award Winning Science Fiction Author, will hangout with SETI Institute scientists Cynthia Phillips and Franck Marchis (host & moderator) to discuss on the Starship Century book and symposiums dedicated to the exploration of our galaxy using a starship. When will we be ready to go there? This hangout is part of the SETI Curiosity Series. This entry was posted in Blog, Video and tagged Allen Steele, event, Geoffrey Landis, Interstellar Research, Science Fiction, SETI, Space, starship century, video by Gregory Benford. Bookmark the permalink.